While day one of our NYC staycation was a day of touring and entertainment, day two was more about relaxing before we tackled a new week. This called for brunch at Alice’s Tea Cup and a spa day at Premier 57 Spa. Fabiola, me, Nanthale, Marcy, Jonquel and Brooke after brunch at Alice’s Tea Cup Chapter II. Disclaimer: This post is in collaboration with ELOQUII, Alice’s Tea Cup, Swimsuits for All and Premier 57 Spa, but all opinions are my own. 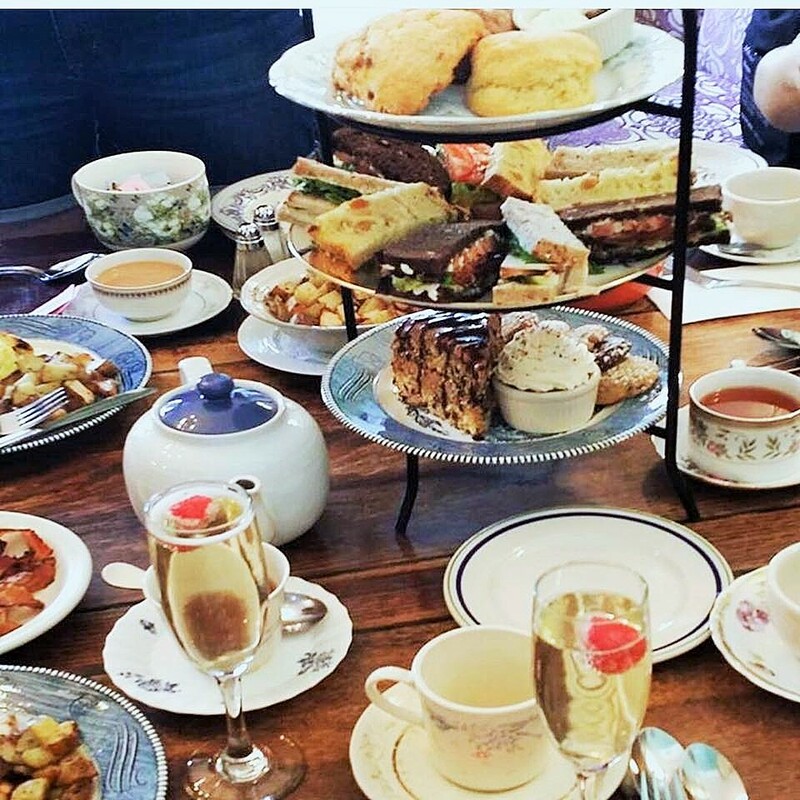 We ordered “the Jabberwocky” – a three tiered tea service that gave us unlimited scones, sandwiches, cookies and cake with three different pots of tea for the whole table. Some of the other ladies also ordered crepes, eggs, hash-browns and other brunch staples that we all took small bites from to try. We also got our first hit of pumpkin before the official start of pumpkin spice season with the pumpkin caramel scones. They were absolutely delicious! I definitely recommend ordering them should you visit and see them on the menu. While we ate we got the chance to talk about what we have going on in our lives including aspirations and works in progress for our individual blogs. We went into some pretty deep places with our conversation to the point that tears were flowing, until the surprising moment when we were greeted by actress Scarlett Johansson as she made her way to a private party at the back room. Sadly we were all too stunned to respond let alone snap a quick picture. 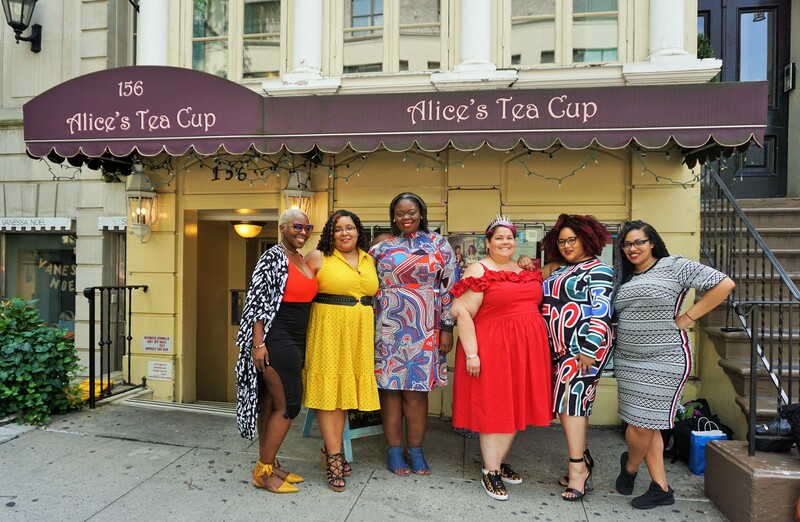 For the most part there isn’t much of a dress code at this tea house, however, with a theme like “Alice in Wonderland” it would be wrong to not dress the part too. 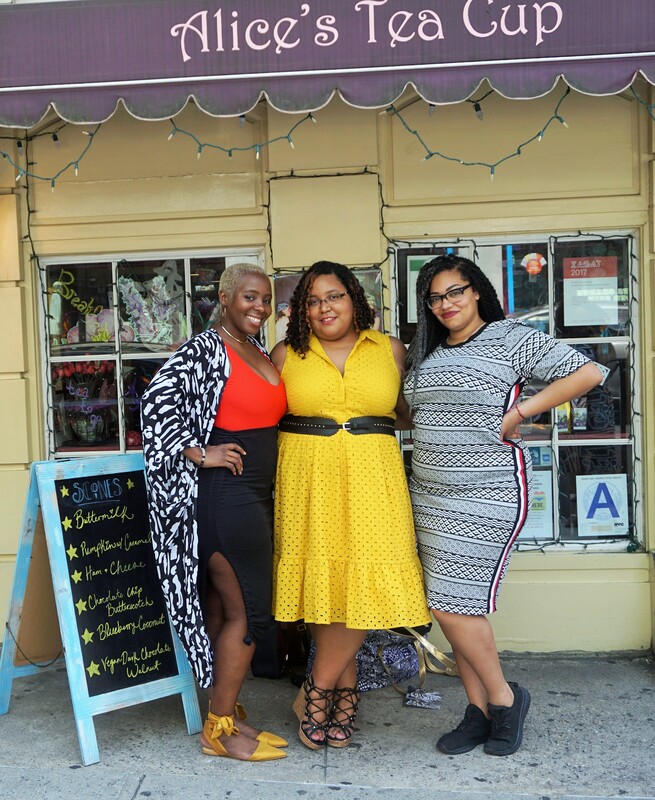 We all came decked out in ELOQUII, with pieces that were very much a testament to our individual style. As we took our pictures outside we kept getting compliments from passersby and we even got the thumbs up from Adam Sandler as he walked past us. Only in NYC! As you can tell, the color yellow has caught my eye this summer and I have been making a point to include it more in my wardrobe. 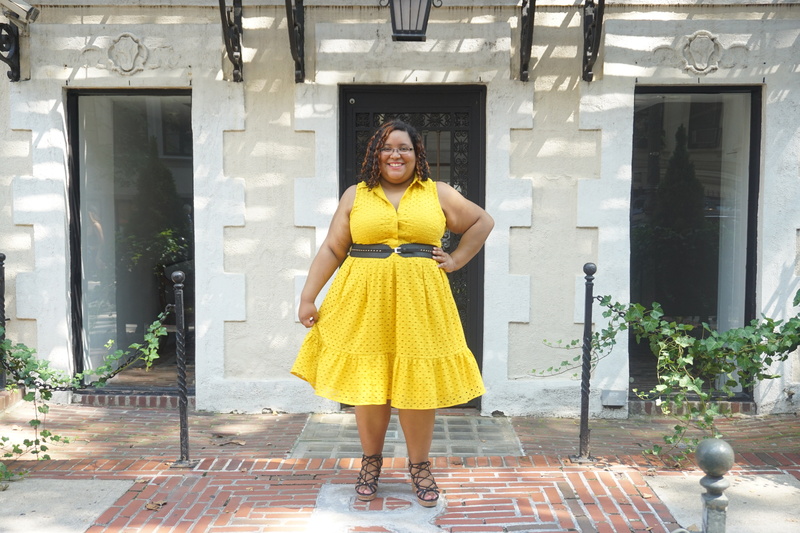 I felt like urban socialite-princess in this dress with the fit-and-flare silhouette and flounce hem that added great volume that I emphasized with a stretch belt. 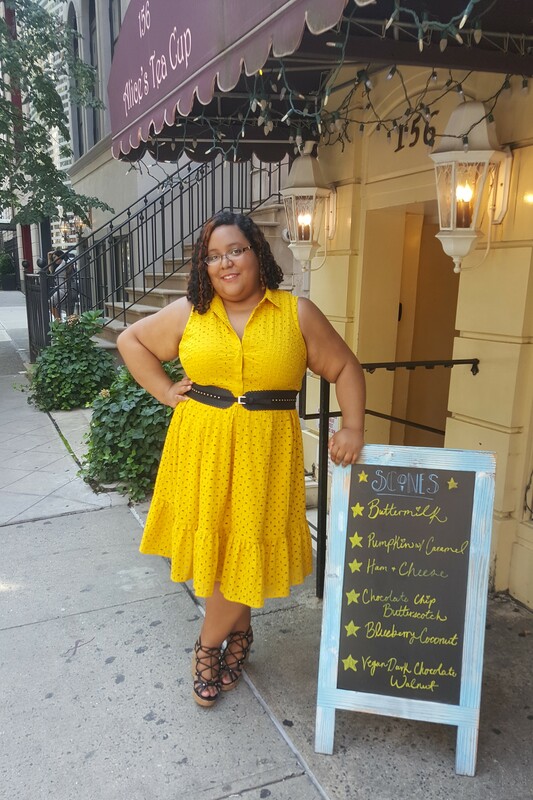 Due to the eyelet detail that covered the entire sunburst yellow dress, I kept my accessories to a minimum. I decided on black accents as a subtle nod to the yellow and black petticoat of the Queen of Heart‘s from Disney’s 1951 “Alice in Wonderland” animated film. The dress is lined and it has enough weight to it that it can easily transition from summer to fall with the right jacket so I know that I will be repeating this piece very soon. 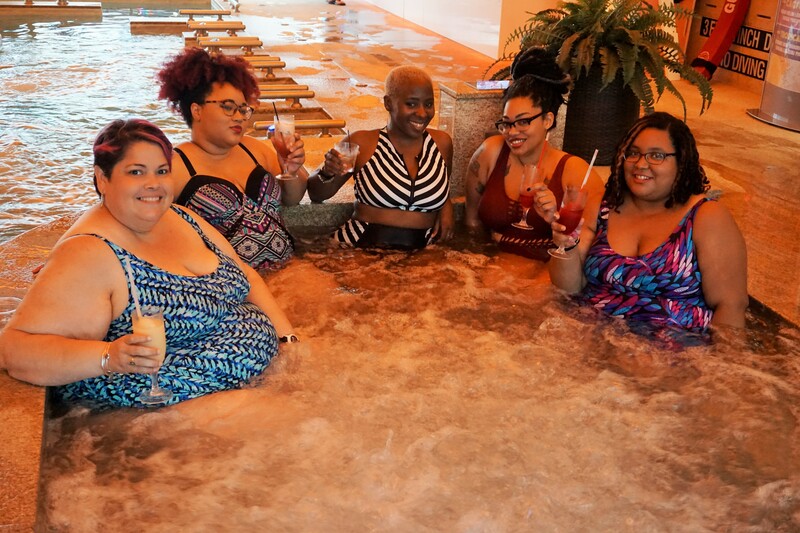 After brunch we walked down seven blocks to what the ladies and I had been looking forward to since we finalized our staycation itinerary – the spa! A hidden gem in NYC, the Premier 57 Spa is located on 57th street between Lexington and Park Avenue. Made up three floors, Premier 57 Spa provides many body treatments and services in a tranquil atmosphere that begins from the moment you enter and trade your shoes for the spa’s comfy slippers. Lounging poolside in Swimsuits for all. A day pass gives you access to the Sauna Valley (made up of six different saunas, each with there own health benefits), the relaxation lounges and the hydrotherapy pools. There is even an infrared zone that gives you all the benefits of the sun without the damaging effects of UV rays which was definitely a treat after that horrible sun burn I suffered through back in July. No, it won’t give you a tan, but the infrared rays do help to reduce pain and fatigue. In an effort to stay together during our time there, we passed on the more traditional spa services like massages and facials. However, we did spend a lot of time in the hydrotherapy pool, enjoying the stimulating aqua-body massage activated by blue touch dials at the side of each in-pool seat. I personally enjoyed the Himalayan Salt Sauna and the ice igloo. Wearing Dahlia V-Neck Swimdress from Swimsuits for All. This was my first time at a spa and I didn’t know what to expect so I wanted a suit that provided coverage and with no built-in underwire because, who wants to feel like they are wearing a bra when you’re supposed to be relaxing? I got exactly what I wanted in the Dahlia V-neck swimdress as it is a a wire-free one-piece suit with molded cups and wide straps for support. Indulging in some drinks in the hot tub. Did I mention that they have a restaurant? 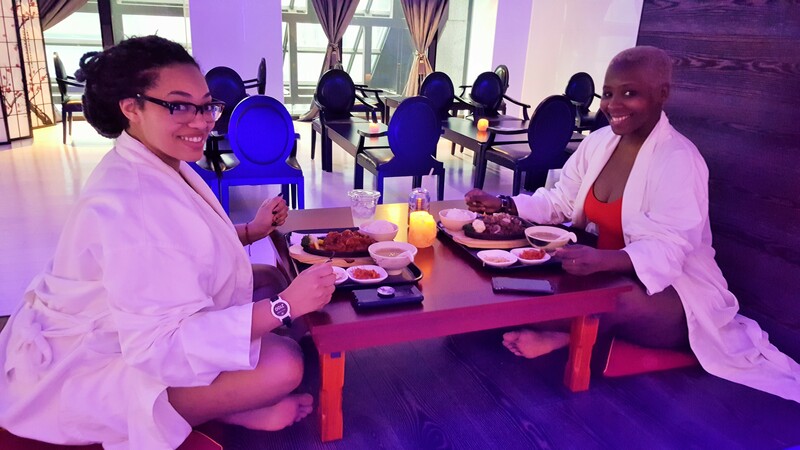 Brooke and Fabiola enjoyed their Asian cuisine in-between their sauna sessions. The spa closes at 11:30 PM daily and once the group was armed with that knowledge it became increasingly hard to find a reason to leave even though we all had work the next day. My time at Premier 57 left me feeling refreshed and so relaxed to the point that I felt the effects well into the middle of my work week. This was only our first visit and we’re already discussing making spa days become either a monthly or annual event on our calendars. Special thanks to Alice’s Tea Cup and to Premier 57 Spa for their amazing hospitality. We had a great time and I know we will be back very soon. *Note: No photos are allowed to be taken in the spa except for the restaurant area. We were allowed the privilege to take some photos only for the purpose of this blog feature.